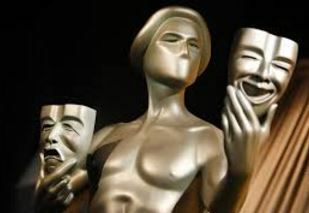 This has got to be the greatest SAG awards presentation ever! It FLEW! And the Good Guys Won! So glamorous, in an understated way. Favorite moments ~ Alicia Vikander, the Swedish star of “The Danish Girl” was looking stunning in an iridescent Louis Vuitton gown composed of sequined panels of black, white and earth tones. She thanked her mother, who is an actress, describing her childhood of growing up in a theater in Sweden watching her mother act. Classy and beautiful. And that charmingly accented British/Swedish speech! She looked divine and she sounded divine! She sounded and looked every inch a star! The New Audrey Hepburn is born! 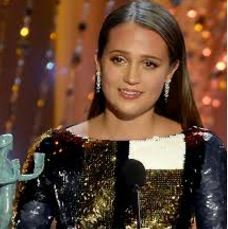 And I’m predicting this the upcoming, inevitable Academy award is just the FIRST Oscar win for the lovely Alicia! She’s unstoppable! “Downton Abbey” winning Best TV Series Drama and a large portion its’ brilliant cast, accepting and Lesley Nicol “Mrs. Patmore” the funny, maternal cook, thanking everyone in Hollywood for being “so kind.” I’m sure THAT’S an adjective that hasn’t been used before about Hwood, and of course, she thanked Julian Fellowes “Who wrote every single word we say. He’s a great writer.” And he is. And last but not least, the wonderful win of “Spotlight” as the “Best Ensemble.” The good guys won! Elba won his second “Actor” in one night for Best Actor in a TV Series, “Luther.” Elba really needed this recognition in order that his name really means something in America. He SHOULD be a household name in the US. And now, I hope, he will be. The camera keeps cutting back to him as the show goes on and he is SMILING the biggest smile and flashing the peace sign at the camera. He can’t stop smiling. Carol Burnett is being given a Lifetime Achievement Award by Tina Fey and Amy Poehler. And of course, she gets a standing ovation! 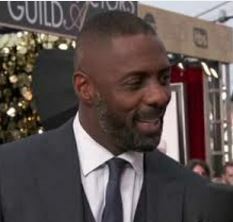 Idris Elba Wins SAG Best Supporting Actor! 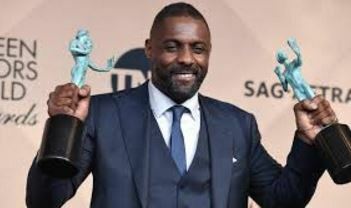 Just as I predicted, Idris Elba won Best Supporting Actor tonight at SAG for “Beasts of No Nation”. 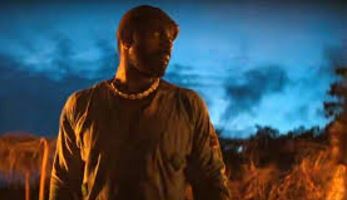 Even though he is REALLY the lead in this film, and his win in a lily-white field shows that the #Oscarssowhite conflagration/controversy can’t be blamed on the 150,000 members(or more) of the Screen Actors Guild. 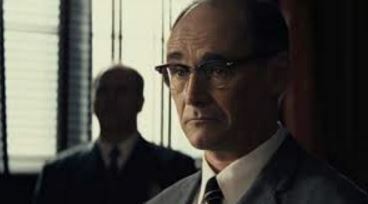 He’s a great actor, and I wish all the world could know it, and perhaps they will. He’s a big star in his native England, and has been for years. And I will make another prediction. He will NOW go on to win the Oscars in the upcoming years, as he should have done tonight. “Orange is the New Black” won Best Comedy TV series and African-American Uzo Aduba won Best Actress in a Comedy TV series. This is her SECOND consecutive win in this category! Diversity is reigning tonight! Good! And now Queen Latifah wins Best Actress in a TV mini-series or movie for playing Bessie Smith! Well, she won AGAIN! Yes! It’s official now! Alicia Vikander is an awards steamroller that can’t be stopped this season for “The Danish Girl”! My Number One Film! I said it before and I’ll be saying it again over and over I’m sure. Brava! Diva! Reprinted from before Xmas! Don’t miss it! I know. I know. It’s barely a week left to Christmas, and everyone’s counting down the Shopping Days. But there’s a post-holiday surprise coming that will reward and enlighten you for years and years to come. It’s going to be a cultural touchstone. And it’s directed by the great Elaine May. And it’s a documentary about her late, great early career comic partner Mike Nichols, probably one of the greatest talents this country has ever seen. And he wasn’t American! He was German! 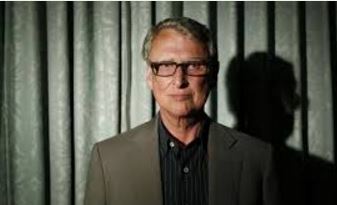 This insightful and also immensely profound and FAIR assessment of Mike Nichols overwhelming career that spanned decades and crisscrossed media with the speed of lightning, making film and theater and comic history as he went. Elaine May is the perfect person to document and analyze all this within the confines of an American Masters special. It’s not on the air until January, but check you local listings and DON’T MISS IT! From an unusual childhood background of escaping the Nazis, Nichols grew up on New York’s Upper West Side, the son of a successful doctor. He sits for a feature-length interview and reveals much that we have never been privy to before. It’s like he was leaving his legacy to his early partner in comic improv and equally early success, Elaine May. Their break-up always stupefied me. But here they both are decades later setting the record straight and settling a few scores along the way. 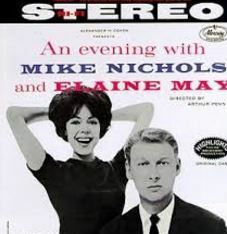 May gets Nichols to reveal the downs as well as the ups of his astonishing career first as a comic sketch artist par excellence with his legendary duo of Him and Elaine May. Nichols and May. I grew up hearing about them, and glimpsing them occasionally on television in the sixties, when they were hotter than hot. Later on in High School or college, I think I even bought one of their great comedy albums. May allows a few laughs here, of course, but they are sprinkled very parsimoniously throughout this great doc. The tone is serious, as well it should be. He was a great artist. She even gets him to burst into tears when discussing Meryl Streep. There are gem-like moments as friends from Show Business pile on the praise and the details. And nobody is harder on Nichols than he himself. And he denotes that he feels he failed as much as he succeeded. Interesting to note that his surviving wife Diane Sawyer, is nowhere mentioned. But Nichols’ life was so chock-full of incidents that I guess she wasn’t needed. It’s quite a complete portrait of an Artist in Full. And what a great Christmas present to know that it is coming soon!